ALL ABOUT PEST can protect your home from pests year-round addressing changes in pest behavior through a proactive treatment program. Subterranean termites are found throughout the United States, but are relatively scarce in the colder states. They occur in greater numbers in warm, southern states. However they exist in every state except Alaska. They are most common in the humid, subtropical south between Florida and Southern California. A subterranean termite infestation begins when warm temperatures and heavy rainfall trigger an established colony to send out a swarm of winged termites. Swarms consist of winged reproductive males and females. Subterranean termite colonies are usually active for three to five years before winged reproductives appear. Winged, reproductive termites are frequently mistaken for flying ants, but are smaller than ants and have straight, rather than bent, antennae. 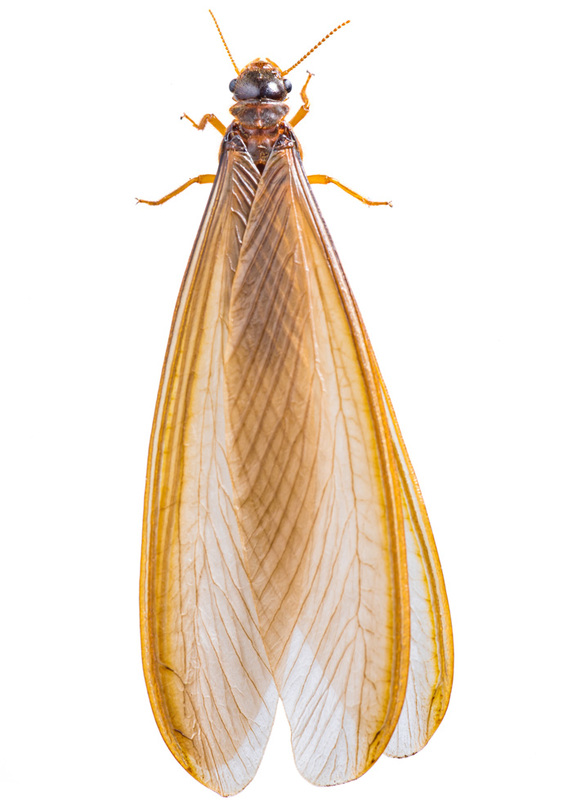 Termite swarmers have four wings that are all the same size. Ant swarmers have two large wings in front and two smaller wings behind. After mating, swarmer termites land and shed their wings, leaving them in piles that resemble fish scales. If there are piles of wings on windowsills of your home, check to see if they are all the same size. They could be termite wings especially if they are all the same size. If you are constructing a new home, especially in a high-risk area, it is advisable that you obtain estimates from reliable professionals for termite-proofing your home. Pest control professionals are best equipped to take preventive measures, which could save homeowners from severe loss. Pest control experts will also be able to make recommendations that can help to prevent termite infestation. 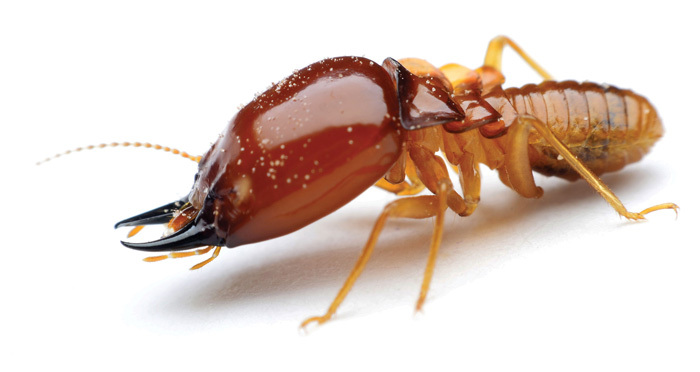 There are over 2,300 described species of termite living today. Many of them are found in tropical and subtropical regions such as deserts and rain forests. However, there are more than 50 species that have been found living in the United States. Collectively, they are responsible for an average of $1 billion per year in property damages, infesting 350,000 structures. These numerous species are broken down into subterranean termites, dampwood termites and drywood termites. The three types of termites differ in colony-building habits and preferred climate. Subterranean termites build large colonies underground, which are composed of elaborate tunnels and chambers. Worker termites then construct protective tunnels made of mud and saliva in order to reach above-ground wood. When subterranean termites eat wood, they fill it with soil to help maintain the humidity. If mud tunnels are visible on the walls or foundation of your home, it is highly likely that you are experiencing a subterranean termite infestation. Termidor is a professionally applied termite defense product that is undetectable to drywood and subterranean termites. Since its introduction, over 4 million homes have been protected with Termidor, making it America’s #1 termite defense product. What types of termites does Termidor control? Termidor controls subterranean termites, including the extremely destructive Formosan subterranean termites, dampwood termites and drywood termites. Through the years, other products have promised homeowners protection from termites. How can homeowners rest assured that Termidor works? Termidor is made from a nonrepellent or “undetectable” chemical technology. In numerous trials across the United States and around the world, Termidor has consistently proven itself to be the most effective product at eliminating termites-a level of efficacy that no other commercially available termite control system of any type has ever achieved. And, Termidor is proving to be equally effective in keeping termites from coming back. Ongoing field trials by the United States Department of Agriculture – Forest Service show no signs of termite damage in covered slab plots treated at labeled rates Termidor® 80 WG for more than 15 years after treatment-results no other commercially available termite control product can match. How does a professional apply Termidor to my home for termites? A Termidor Certified Professional will apply a liquid dilution of Termidor along the foundation walls of your home to create a continuous treatment zone. The application method is called “trenching” or “trenching and rodding,” and may sometimes require drilling holes through slabs or other hard surfaces adjacent to the foundation of your home for maximum protection. Your Termidor Certified Professional may also treat conducive or termite active areas from the interior of your home, depending on the extent of the termite infestation and damage. Depending on your situation, a minimally disruptive Termidor treatment along the exterior perimeter (PerimeterPLUS™) of your home may be all the protection your home will need. Where can I buy Termidor? Termidor cannot be directly purchased or applied by homeowners. Only licensed pest control professionals who have taken TermidorCertification Training are authorized to purchase and apply Termidor. You can find a Termidor Certified Professional in your area using our zip code locator. How fast will Termidor work to eliminate termites? Termidor applied according to label directions has provided 100% control of infesting termites in three months or less after treatment. Can Termidor be used for both residential and commercial buildings? Yes, a Termidor Certified Professional can offer termite protection to most any type of structure that is at risk for termite damage, including residential homes, churches, office buildings, commercial businesses, warehouses, manufacturing sites and schools. How long will it take to complete a Termidor termite treatment? A residential Termidor termite treatment is typically completed by a trained Termidor Certified Professional in less than a day, offering your home or building termite protection that begins immediately. Will Termidor have or leave an odor? No, Termidor has virtually no odor. What makes Termidor different from other termite control options? Like many other termite control products, Termidor is a liquid-but that’s where the similarities end. Among liquid termiticides, Termidor is the most effective. That’s because Termidor is undetectable so termites neither avoid its treatment zone nor try to find a way around it. Some nonrepellent liquids claim to be “nearly,” “practically,” or “almost” as effective, but the difference between “almost as good as Termidor” and Termidor itself can make all the difference in the world when it comes to protecting your home from termites. How much will a Termidor termite treatment cost? The cost of a Termidor termite treatment varies and largely depends on your particular situation, the treatment plan and service package you and your pest control professional agree upon. Termidor is one of the most thoroughly reviewed termite control products. Termidor is registered with the Environmental Protection Agency. It should only be applied by a pest control professional who has been trained in correct application methods. Termidor is effective even at low application rates and bonds to the soil in which it is applied, so homeowners need not worry about leaching of the product. Termidor is not a petroleum-based material and will not cause harm to plants adjacent to the areas of application. How long will a Termidor treatment last? Ongoing field trials by the United States Department of Agriculture-Forest Service show no signs of termite damage in concrete slab field test plots treated with Termidor® 80 WG at labeled rates for more than 15 years after treatment-results no other currently available termite control products can match. With regular follow-up inspections from your pest professional to ensure your “Termidor Zone” remains in place, you can rest assured you have the very best on-going protection from termite damage available for your home. Does Termidor come in a bait formulation? Termidor is a liquid termiticide with a completely different mode of action than baits. If your pest professional recommends a baiting or monitoring option for your home and termite situation, you can’t do better than the Advance® Termite Bait System. Termidor eliminates termites several ways. When termites eat Termidor-treated material, they will die. But Termidor doesn’t stop there. It eliminates termites by contact as well. And since termites can’t detect its presence, termites can directly ingest and contact Termidor as they go about their normal routines. Whenever a termite ingests or touches Termidor, it can become a “carrier,” transferring Termidor to other termites it contacts. These termites, in turn, can become secondary carriers, behaving normally while they transfer Termidor to other termites they contact-and so on within the colony. Because Termidor is slow-acting, it gives individual termites ample time to transfer it to others in the population. This unique, spiraling process is called the “Transfer Effect,” and its devastating results maximize the protection of your structure. Alternatively, Drywood termites make their nests within cellulose-based materials such as lumber, siding and wooden trim. They require no soil contact and get their moisture from the wood. They also attack floors, furniture and books. Drywood termites can be more difficult to detect and aren’t typically noticeable until small piles of pellets (their feces) collect. Drywood termites are destructive creatures that enter the building through various crevices. They are commonly found in the attic where they slowly eat through the building’s materials before their presence is detected. Despite leaving dust trails as well as gaping holes in various wooden surfaces, detecting these critters during the early stages of infestation is incredibly difficult for nonprofessionals. 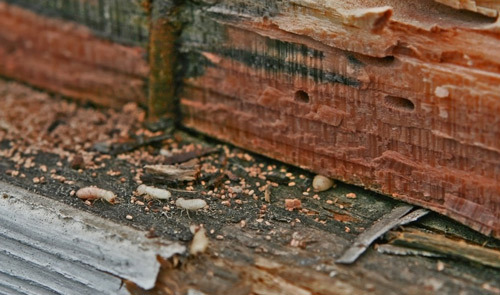 Our services detect the presence of drywood termites well before they are able to cause extensive damage. Our services are designed to guarantee a complete elimination of drywood termites. Because these termites live within the structure, fumigation is the most effective method of drywood termite control. Termite fumigation with Vikane® Fumigant is an effective and safe procedure. Our treatments are odorless and don’t leave residue on any surfaces in the home. These products are environmentally sound and do not contribute to ozone depletion. With a complete range of services, you can rely on All About Pest to safely eliminate termites before they cause extensive damage to your property. All About Pest provides a complete range of services for resolving problems with drywood termites in the Tampa Bay area. We offer both prevention services as well as treatment options. Our professional staff is trained to handle all the nuisances involving Florida properties. Localized infestations can often be handled by drilling and treated the effected area of your structure. ALL ABOUT PEST can assess the condition of colony and treat it without using invasive fumigation techniques. All About Pest uses Termidor advanced undetectable liquid technology. That means termites cannot see, smell, taste, or avoid it. Instead, they contact, ingest and share Termidor, completely unaware that doing so inevitably will kill them. Termite fumigation is necessary to eradicate extensive colonies Drywood termites ranging from 3-5 years in age. With fumigation, insects are eliminated from a structure using a registered fumigant. At All About Pest, fumigations are carried out using Vikane® Gas. Vikane® is odorless, colorless and leaves no residue. Because it is an inorganic gas, when used according to label directions, Vikane® gas fumigant completely dissipates from a structure following fumigation, leaving no surface residue, odor or film behind. This means you will not have to wash dishes, linens, clothing or furnishings after fumigation. Vikane® gas fumigant has been proven through nearly half a century of practical use in more than 2 million structures. The peace of mind that comes from knowing a home will be free of drywood termites requires preparing it for whole-structure fumigation with Vikane® gas fumigant. Preparation involves bagging food, removing pets and plants, and arranging for lodging. Many homeowners take this opportunity to clean out clutter and get away or visit family. Or take a minute to send us a detailed message to see how we can help you get your pest problem under control.